The cooling system of your vehicle will be working hard this summer as temperatures in Truckee and Lake Tahoe heat up. To be sure your truck, SUV or car can take the heat have a qualified technician at Quality Automotive and Smog run through a checklist of items that will keep you on the road. Here are some things to consider in maintaining a healthy cooling system and your safety on the road. The ratio of coolant in the radiator should be 50:50 with the manufacturer recommended coolant for your engine and distilled water. Coolant should be flushed and changed regularly. The professionals at Your Trusted Local Auto Care suggest it be done annually for Glycol systems and every 100K with modern coolants. This keeps the system fresh and free of containements which will prevent corrosion and assures that the coolant has the proper boiling point and protection. If you experience overheating while driving, pull over at the next safe spot. 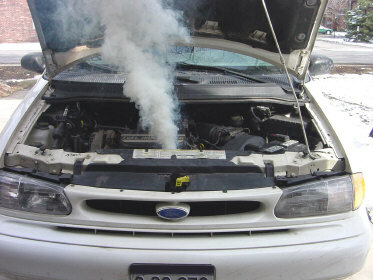 You can do severe damage to your engine if you keep driving. Call roadside assistance (provided with every service at Quality Automotive and Smog) to help out. DANGER: Never open the radiator cap while the vehicle is hot! It’s a good idea to have a pressure test, a thermostate test, a cooling fan test and a visual inspection for leaks and corrosion, performed annually and especially before any trip. These checks are provided for Quality Automotive and Smog customers with any service. We call it ServicePlus. Hoses and drive belts should be checked for cracks, bulges or frayed edges. This simple inspection can relieve you of a lot of headache if it blows driving over Donner Summit. Again this is included in Quality Automotive and Smog's ServicePlus. The radiator should be kept clean by periodically using a garden hose and a soft brush to carefully remove bugs, dirt and debris. With driving conditions in the mountains that includes pollen, road dust and bugs, this is an often overlooked simple maintenance item.